Mary Kay recently released a range of new products and these 4 gorgeous lip glosses were apart of the launch along with their cream eye shadows, which I've reviewed here. I used to be a strictly lip gloss girl, but lately I've skipped them in favour of lipsticks. But that's about to change. When I first tried these, it was love a first use. The lipgloss has a doe foot applicator which is easy to use. 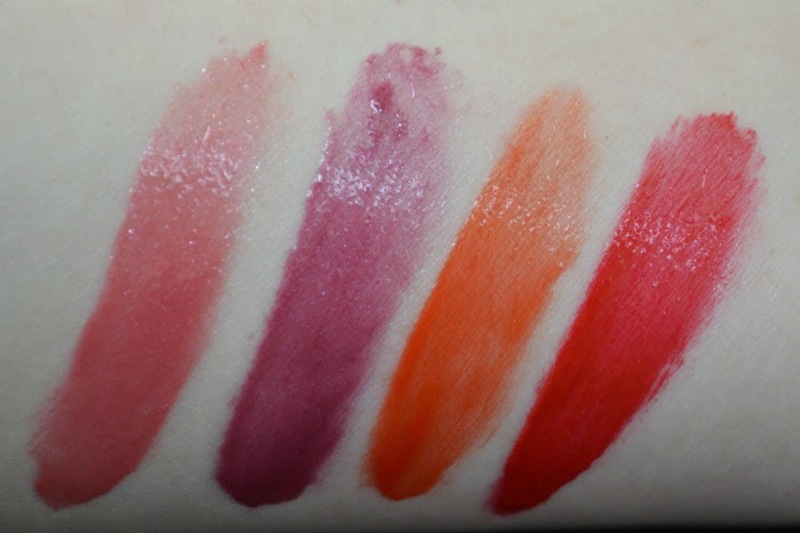 While lipglosses usually have a light pigment, I found that these pack a huge punch, especially Mango Tango and Rock And Red. I was actually expecting it to be sheerer and was so surprised when I applied Rock And Red onto my lips for the first time. It's very vibrant, especially for a lipgloss. The above photo is one swatch onto my skin. As you can see, it's easy to build up the drama with just with one extra swipe of the applicator. Berry Tart is perfect for anyone that wants to get into purples, but is cautious about pulling it off. You can build up the colour to be more vibrant until you feel comfortable switching to a purple lipstick. My favourite colours are Rock And Red and Mango Tango. Rock And Red is a gorgeous strawberry red. It's very vibrant and is a great spring/summer alternative to a red lipstick. I've always loved tangerine colours on others, but being pale it never seemed to suit me... until now. Because it's a lipgloss, it doesn't give my lips a block colour. Instead my naturally pigmented lips create a base where it looks a bit more red based on my lips, rather than orange. It ends up meshing really nicely. With these, I get between 2-4 hours of application and colour. Once I get to the 4 hour mark, I need to reapply as I've normally lost the colour from talking/eating/drinking. What I love about these is the fact that it's not goopy or heavy on my lips. It feels so comfortable and really hydrates my lips, so I don't need to apply a lip balm over the top in the 2-4 hours of wear. If you do build them up so they're extremely vibrant, you may want to use a clear lip liner to make sure it doesn't move outside your lip liner. Innoxa, Models Prefer and Mary Kay all do great invisible lip liners. These retail for $23.00 here in Australia or $26.00 in NZ. While they're a bit more expensive than my other lip glosses, they out perform them in every way! 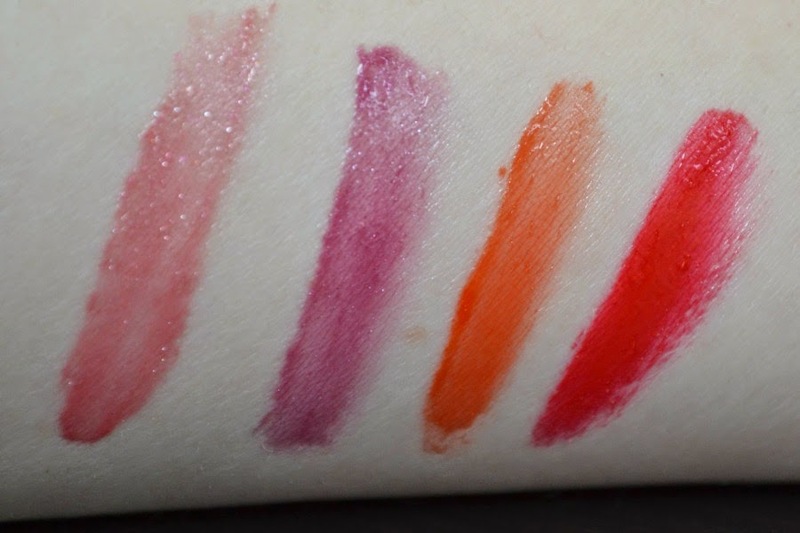 They have 4 existing lipglosses in the range, which you can see here. Do you prefer a lipgloss or lipstick?